During the London Olympic Games this past summer, a short article in a British newspaper piqued my interest. Apparently, various London funeral parlours were very concerned that the masses of extra traffic on the London streets would make negotiating roads difficult for their horse drawn hearses. Naturally, this begged the question: “Can Victorian era horse-drawn hearses still be hired today?” This led to an internet search and, lo and behold, Victorian style horse-drawn hearses can be hired in the UK and in other countries for funerals, even Canada and the USA. 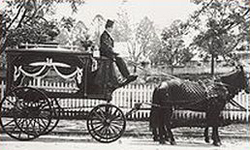 While some of the Victorian accoutrements and social customs have long since been discarded like giving out jewellery, braided hair art, scarves and gloves along with hired mourners, pall bearers with batons, pages, mutes and feathermen, the use of horse-drawn hearses remains largely the same today. The Victorians became fascinated with death, mourning and funerals after the death of Queen Victoria’s beloved husband Prince Albert in 1861. Queen Victoria herself remained in seclusion for ten years and in mourning for the next thirty. In doing so she created a fascination with funerals and mourning practices which then become a huge business in Victorian England for whom no expense was spared. Even the poorest people saved their pennies to be able to provide their dead with a proper send off who sadly all too often were their young children. Cemeteries were established around the 1820s as people had concerns about burials in village churchyards. These cemeteries were usually located outside of the towns or villages requiring transportation for mourners and coffin. If a funeral parlour did not have enough clients to warrant owning their own hearses and teams of horses, this task was contracted out to a carriage-master who could serve several funeral businesses. 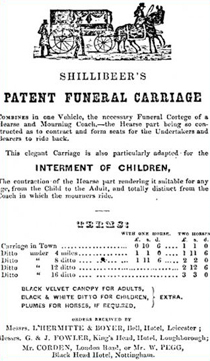 George Shillibeer’s ad for his all in one hearse and carriage.George Shillibeer’s ad for his all in one hearse and carriage. George Shillibeer of England (1797-1866) was the man credited with designing a large horse-drawn vehicle capable of transporting large numbers of people, the forerunner of omnibuses which later became buses. After getting out of prison for unpaid debts, he created a vehicle which could transport the funeral mourners along with the coffin of the deceased. These were called Shillibeer’s Funeral Coaches and their popular all-in-one design continued after his death. A hearse and horses laden with ostrich plumes were indicative of a person’s wealth and often families hired extra horses and coaches festooned with plumes. In 1869, James H. Shanahan illustrated a variety of these ostrich plumes with removable tops in his Illustrated Catalogue of Undertakers Hardware and Trimmings. Poor people did not deserve plumes at all while two plumes meant that the deceased was of modest means while three to four meant that he or she was better off. If you could afford five or six plumes you were wealthy but having seven plumes was reserved for the truly rich. For the poor, for about $8 Canadian today, one could have a hearse with one horse, a mourning coach also with one horse, an elm coffin covered in black with handles, mattress, pillow, side sheets and a coachmen with hat bands and gloves and an attendant with a silk hat band. For about $85 Canadian the funeral took a huge leap forward and one could have a hearse with four horses, two mourning coaches with fours, twenty-three plumes of ostrich feathers, and velvet coverings for hearse and horses. Funerals have always been an expensive business for the surviving relatives and the 1843 report on ‘Interment in Towns’ found that the average funeral expenses of the aristocracy was £800 in 1843 prices or $1,271Canadian today while the ‘upper gentry’ paid from £200 in 1843 prices or $315 Canadian today. Ostentatious funeral displays reached their zenith in the 1850s but by the 1880s more modest ceremonies were preferred by most. One report states that a quarter of all money invested in banks or burial clubs in the Victorian era was set aside for funerals. Many individuals had more money spent on them dead than when alive. This family merited multi funeral carriages. The hearse was black with gold and silver decorations and was filled with flowers visible through the glass windows. A large canopy of ostrich feathers covered the hearse while the coffin inside was shiny and polished. The hearse pulled by either black or white horses was first in the funeral possession followed by coaches full of mourners who sat behind drawn blinds. Normally, unmarried women and children had white horses to pull the hearse while men had black ones and if the family wanted black horses and none were available, the funeral director would dye the horses black to suit. The men wore full mourning with crepe bands around their top hats and the ladies wore black crepe gowns with black veils and gloves and dabbed at their eyes with black edged handkerchiefs. Mourning fans of black ostrich feathers were held at the ready and ladies wore jewellery made of jet or black amber. The procession made its way from the deceased person’s house towards the cemetery but often made a detour through a busy part of town to get the maximum effect for the money spent. Once the trip through town was complete, the procession moved into a brisk trot until the cemetery gates were reached and then a sedate walk was in order towards the chapel for the ceremony. The burial itself was witnessed by the men only and then the whole group returned to the house for a meal. My question is about the plumes. They were originally made of Ostrich Feathers. I read recently that the wearing of Ostrich Plumes was banned because they could weigh up to 6llbs especially when wet with rain and they would also blow around in the wind causing serious discomfort to the horse. Can you tell me if the plumes used today are Ostrich Fleathers and why are they still being used? This company is located in Hertfordshire, England and offers funeral services using modern cars, elegant older style cars and horse drawn hearses. Their Friesian horses have won driving awards and awards at The Royal Windsor Horse Show. i,ve a question. I came across what I’ve been told is an ornament off of a horse drawn funeral hearse. It is a gold cherub with curly hair and wings about the size of a mans hand. Where can I find photos of ornaments that may have been used for this purpose! Hi Audrey: I think if you “googled” Victorian funeral and hearse ornaments, or Victoruan funeral customs, or variations of those words you will find lots of websites with information. Possibly the item you mention might have been for a child’s funeral. The other option is to find a website that deals with Victorian funerals or hearse ornaments, and send them a photo of the item. Perhaps they can give you more information. Why does only one of the horses have a cloth, draped on the side of its body? Hi Jane: Good question. I have looked at lots of Victorian funeral pictures and in some there are no cloths, in others there seems to be one, and in others there are two. I am assumng they were only draped on the outside so as not to interfere with the harness and tack. If you google “Victorian funerals” there are lots of websites that may discuss this issue. Possibly a person of higher social standing might have merited 2 cloths instead of just one.